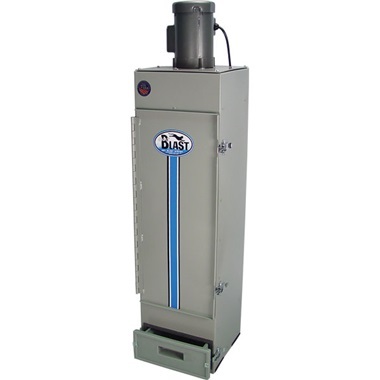 Commercial-Grade Made-in-USA Dust Collector increases visibility while abrasive blasting - pulls 300-350 CFM! Patent Pending. Model 180-DC has Triple Bank HEPA Filtration. The result is 40% more airflow through the cabinet and dust collector, and increased visibility and dust collection over older bag-style units. Plus, 125% larger filtering area! 16"W, 15"D, 56"H. Ship wt 159 lbs motor freight. Unload or Liftgate Service is available for this equipment (extra cost, in addition to freight adder). Click on Unload or Liftgate Service in suggestions below for details. • TRIPLE BANK HEPA FILTRATION (3 filters) has 125% more filtering area than old-style bags used on 176-DC. 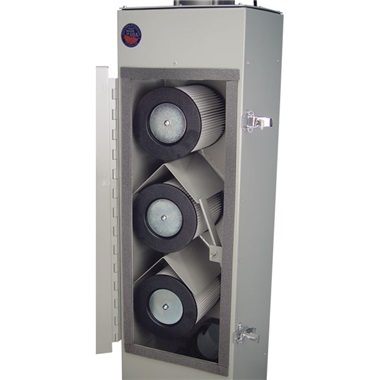 The result is 40% more airflow through the cabinet and dust collector, increasing visibility and dust collection. • NON-STICK FILTER MEMBRANE - resists clogging. Most dust simply falls off filters. To clean, shut unit off, shake down filters with lever on rear of unit, then empty drawer. Upgraded our VAC-50 on a 960 Pro cabinet and saw a big improvement. Dust collection is better and the noise level is MUCH lower. I wouldn't say the VAC-50 is a bad dust collector but this is so much better. Service & Delivery comments: Unit arrived on time and in perfect condition. I bought this for use on a 5ft long blast cabinet. Can't comment yet on durability but love that it is a USA made product. Looks heavy duty. Clears the dust from my cabinet well and I'm using a turbo nozzle. I use this in a professional shop (HillbillyWizard Axle Refurbishing) and it is suitable for daily use. The exhaust air should be vented outside or use the filter bag (not included) to keep dust out of the shop. Have about 15 -20 hrs of run time on it so far and happy with the product. Sound level is not bad given the volume of air being moved. Absolutely phenominal - don't hesitate to buy! Pros: Easy access to filters., Easy To Setup, Filters are easy to clean with water., Keeps the blast area clear., Manual shaker to unclog filters. I had the Vac-40 and it worked well but I ended up using the SC40 blast cabinet more than anticipated and the Vac-40 was over-taxed. The 180-DC HEPA dust collector made a phenomenal difference! I use the cabinet and dust collector for my personal car projects and the dust collector provides a clear view of the work. I wish I would have ordered it to begin with!!! The dust collector has a built in manual shaker that allows you to knock crud loose from the filters. When it is time to clean the filters the access door is nice and large so access is easy. Remove the HEPA filters, rinse them with water, allow them to dry and you are ready to go again. The dust is collected in the pan at the bottom of the collector - just dump it in a bag. I couldn't be happier! Service & Delivery comments: UPS Freight had some issues.....they said they couldn't find my house even though they had delivered a blast cabinet and air compressor on two previous occasions! I ended up having to drive to their depot and pick it up myself, otherwise they said they would attempt delivery again in a "week or so" and I needed it sooner than that. TP Tools was not the issue - it was all on UPS Freight. Even at that, TP Tools was very accommodating and went above an beyond what I expected given they have no control over UPS Freight. We use our front load Bead Blaster all day long and this dust collector really does a good job.Cant believe the difference. Should have bought this a long time ago.Highly Recommend it. I bought this for a pressure pot blasting cabinet with a volume of about 50 cubic feet. It is used in the same area that several aircraft are stored, so I really wanted to eliminate dust spreading into the air. This dust collector does a fabulous job. I use the optional final filter bag. Service & Delivery comments: I also want to note that TP Tools customer service is fantastic. My dust collector arrived with a bent door. When I contacted TP Tools about it and sent a photo, they sent out a replacement door THE NEXT DAY as well as throwing in a couple of extra parts and a gift certificate for my trouble. You can't go wrong here, folks.